Precision built in the USA, Daniel Defense Rifles are engineered with the tactical professional and shooting enthusiast in mind. The DD5 V2 is the culmination of years of hard research and development, resulting in a whole new level of the .308 AR platform. 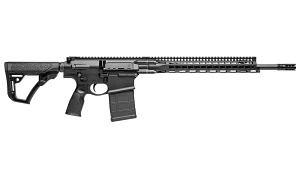 Innovative features like a 4-bolt connection system utilizing a unique barrel extension, an optimized upper receiver, an improved bolt carrier group, ambidextrous controls, a configurable modular charging handle, a cold-hammer-forged 18" barrel, rifle-length gas system, and two-stage Geisselle SSA trigger, the DD5 V2 establishes a new tradition in 7.62 rifles. 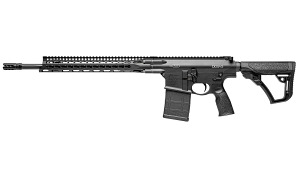 Finished with a Daniel Defense Superior Suppression Device, stock, pistol grip, and a lightweight 15” keymod rail system, the DD5 V2 weighs only 8.6 lbs. Comes with one 20RD Magpul PMAG, manual, and hard case.